Did you know you can connect your WordPress website to HubSpot CRM? If you are one of those who had been waiting for this integration to happen, then your wait is finally over. Now WordPress and HubSpot can work together through WordPress plugin. So many people thought, the best outcome can come if WordPress and HubSpot worked together. This is because WordPress was created as a blogging platform and HubSpot was specialized in inbound marketing from the very beginning. But attractive contents are in the core of marketing. WordPress has its upper hand here. On the other hand, HubSpot has the ability to turn your customers into your advocates. Together they can help you in your business. Considering the possibilities weForms came forward to help these people. 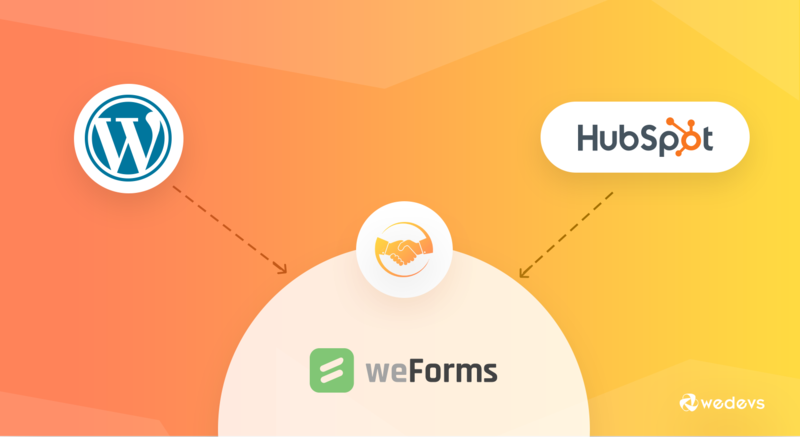 You can now connect your WordPress website to HubSpot CRM with weForms. In simple words, the purpose of connecting WordPress to HubSpot CRM is to get the highest outcome boosting your marketplace position. E-commerce is growing and so the idea of inbound marketing is popularizing with it.WordPress has the best CMS (content management system) and HubSpot is famous for it's CRM (Customer Relation Management). WordPress is currently being used by more than 28% of websites available on the internet. On the other hand, 92% of the companies are currently using HubSpot. Maybe it was the demand of situation that they should work together. The collaboration has become possible with WordPress's plugin facility system. The WordPress contact form plugin, weForms now allows you to integrate the systems. The process is super easy. How can you Connect WordPress to HubSpot? This is a cakewalk now to connect WordPress to HubSpot CRM. You don't need to be a tech-expert to do that. But you need to have an appropriate plugin installed to your site for that. There are a number of plugins for this and weForms is handier than others. It is not necessary to have the premium version to connect WordPress to HubSpot. You can do it with its demo version too. Let's see how you can use weForms to merge your WordPress site to HubSpot. First of all, you'll need to have weForms installed into your WordPress site. If you don't the have the plugin installed in your site then don't worry. Just go to your WordPress dashboard. Then get to plugins. Click on add new and find weForms from search option and then install to activate it. Then click on weForms. There is an options tab named Modules. If you click on modules, it will show all available modules for weForms. Now you can easily activate HubSpot finding it from available modules. After that, you will need an API key. For API key you will have to visit the settings section. Select HubSpot from general settings. Then click on “HubSpot API key”. Now this will redirect you to a new page of HubSpot. You still don't have the API key. 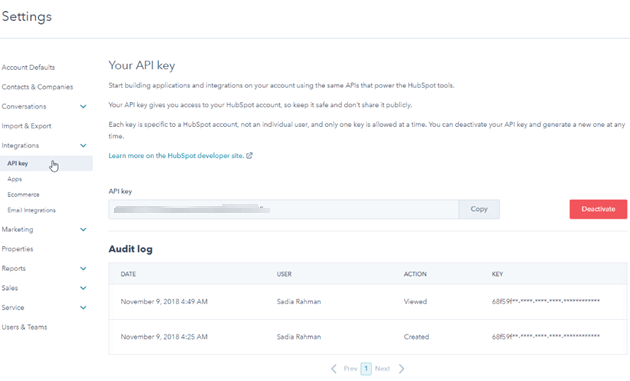 So to get it, click on Integrations as shown below and it will take you to the page that has your API key. Now you have to copy the API key provided. Now go to all forms again. Select the form you want to integrate with HubSpot.There is an option named ‘Integrations'. Go to that option to activate HubSpot. When you click on ‘Integrations' it will load a page that has all the available list of integrations for weForms. 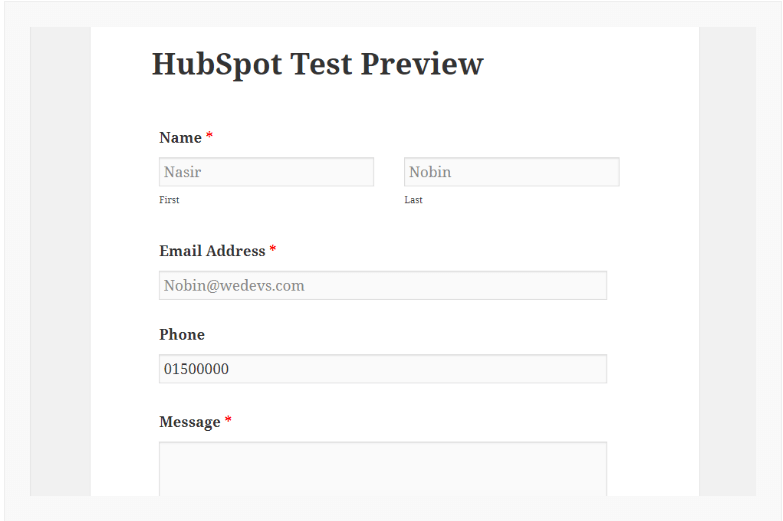 Now look for HubSpot and map the form input fields with HubSpot for your First Name, Last Name, and Email. Now select fields that you want and sync the list with. This syncing will send those WordPress data to your newly integrated HubSpot site. All you have to do is enter your name and email to keep the record and save it. You are almost done. Now, to have a glimpse of this integration click on the preview button it will take you to the front end. Enter a name and all the other required fields and submit to see if the integration is really working or not. After submission, if you see your name on the list as HubSpot owner then you are successful in merging WordPress to HubSpot. If you still have confusions about how to run this process you can check the weForms-HubSpot integration video. Hopefully, that will answer all your questions. HubSpot has this keyword research option in it. When it is integrated with WordPress you don't need to use any other software to search keywords for your contents. You can search for your desired keywords by saving the time with it. Keywords help you with the contents you are about to create. But HubSpot has this on page SEO system that helps you organize your present contents to provide it with better ranking. It has a social sharing option. This makes your contents available to everyone. HubSpot is very strategic in dealing with customers. As it has contact forms of customers, that knows how to deal with them according to their purchasing records. It can take care of all the customers in the list individually. Such as it won't bother the irregular and regular customers with the same information. This special care may turn those customers into their advocates. HubSpot's call-to-action strategy integrated with WordPress can bring lots of potential customers to your page. Disney is the user of integrated WordPress and HubSpot solution. Panasonic, Crate and Barrel, Garmin use this solution too. According to them, this integration has brought huge traffic in their site and their conversion rate has also been escalated. This means the integration brings exactly the results that were expected. WordPress users are most comfortable with the system and they want to hold onto that at any cost. But it made them confused about what should they do when it was about business. This problem is solved too with weForms. So, if you were wondering about what you should do then stop wondering and make your WordPress site meet HubSpot CRM to experience the best of it today. A feminist writer. Ready to explore new ideas. Passionate about writing regardless of any genre. Thanks for the details. I see this integration is only form basis, do you have account based integration? Meaning wordpress has native account opening where it allow people to login with user name and password. can this information could be moved to hubspot? The problem we are facing is only hubspot form can store UTM but not the wordpress accounts opening. Any idea?